Only HENRY can offer the high-performance installation products and systems to keep you at the top of your profession and help you grow profitably. Great products for carpet, resilient and wood installations, developed with the leading flooring manufacturers. Full line of subfloor preparation products from patches to high-performance underlayments and embossing levelers. 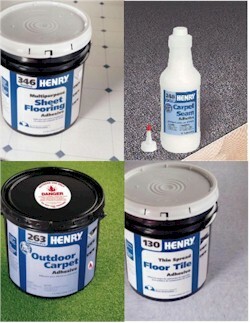 HENRY brand product warranties - the best in the industry. Easy-to-read, informative labels and packaging. Support programs, literature and technical information to make your job easier.